"shine your shoes with renovating polish"
About Us Adhesives Angelus Leather Dye Angelus Neon Paint Angelus Shoe Wax and Leather Paints Brisbane Suburbs Christian Louboutin Sole Repair Collonil Shoe Car Care Products Colorchart Contact Us Dreamfeet Greek Style Sandals Gun Case Repair Horse Care Products Horse Riding Boot Repair Index Ladies Handbag Repair Ladies Shoe Repair Leather Dye and Oils Mens Shoe Repair Motorbike Boots Repair Mountain Ice or Rock Climbing Boot Repair Non Slip Soles and Heel Grips Other Payments Postage Costs Outside Australia Price List Brochure Products R M Williams Shoe Deodorant and Shoe Perfume Shoe Insoles and Heel Grips Shoe Paint and Shoe Polish Shoe Repairs Shoe Stripper and Shoe Cleaners Suede and Nubuck Suitcase Repair Testimonials Tips and Tricks Waproo Leather Colour Change Waproo Leather Dye Waproo Raven Oil Waproo Renovating Shoe Polish Waproo Shoe Cream Waproo Sprayon Colour Change Waproo Suede and Nubuck Waproo Waterproofer Waterproofing Products Zipper Repair Click on the Arrow then press "Go"
Shoes have been an integral part of our good grooming . A perfect dress code with elegance includes well polished shoes which can open all doors of opportunity for you. Shoes forms one of the most important aspects of your dressing shiny shoes and considered to speak about your self esteem and sense of respect you demand for yourself. Polishing your shoes with Waproo Renovating Polish can be absolutely easy and simple if you know how to follow simple steps and you'll get a mirror shine on the shoes. Waproo Renovating Polish comes as wax in 45g container or as liquid renovating polish in 75 ml bottle. 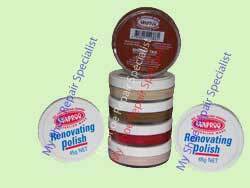 Waproo Renovating Polish is a premium wax based shoe polish that is used to adequately seal scratches and scuff marks. Waproo Renovating Polish comes in 48 colours which you can choose from that suit your needs. Click here to view the range of colours available. Waproo Fashion Liquid Renovating Polish is available in limited colours of white, neutral,black, medium brown, dark brown and bordeaux. Both can be used for smooth and grained leather. Not only does it cover scuff marks and scratches, regular use can prolong the life of your shoes. Insert the shoe tree or use your free hand to hold the shoe firm. If shoe lace is present, remove it first to clean the underneath. Remove the dust, dirt or lint from the surface of the shoe using a damp cloth or a shoe brush. If you use a damp cloth, allow shoes to be completely dry before applying the polish. Apply Waproo Shoe Cream if the shoe has too many crevices or wrinkles. Otherwise, use a soft cloth and dip into the Renovating Polish taking a small amount of polish. Apply the Waproo Renovating Polish evenly on the shoe in circular motion spreading all over the shoe uniformly. Ensure that wrinkles and crevices are worked well. Leave the shoe for a few minutes while you do the same procedure for the second shoe. Once you find the first shoe a little dried from polish, using the Horse Hair Shoe Brush or soft cloth buff the shoe gently into a glittering shine. 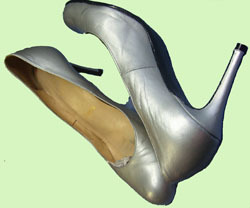 Repeat the same step on the second shoe and you are ready to use your mirror shine shoes. With regular application (at least once a week) of Waproo Renovating Polish prolongs the life of your shoes. You are assured of having brilliant shiny shoes at little effort and in a short time. Make sure you remove the dirt or stain first before applying polish. Tip: Always follow the instructions on the label of the product for better results.